What are the Best Shoes For Plantar Fasciitis? Your feet carry your entire body’s weight every time you stand or walk, and so they are one of the parts of the body that will always be under a lot of pressure. All this pressure means that they are bound to likely some problems at some point. If you run or walk a lot, or you’re on your feet for many hours a day, your chances of having problems with your feet are even greater. One of the most common foot problems that you are likely to develop is plantar fasciitis. Although various things can cause this annoying problem, overuse of the feet is the most common one. And its main symptom is heel pain when you make your first few steps in the morning. Plantar fasciitis treatments range from resting your achy feet to taking anti-inflammatory medicating to surgery. However, a significant percentage of individuals with the foot problem will get enough relief and their feet can even start healing just by changing their footwear. However, footwear is only be helpful for plantar fasciitis if you choose the right pair. 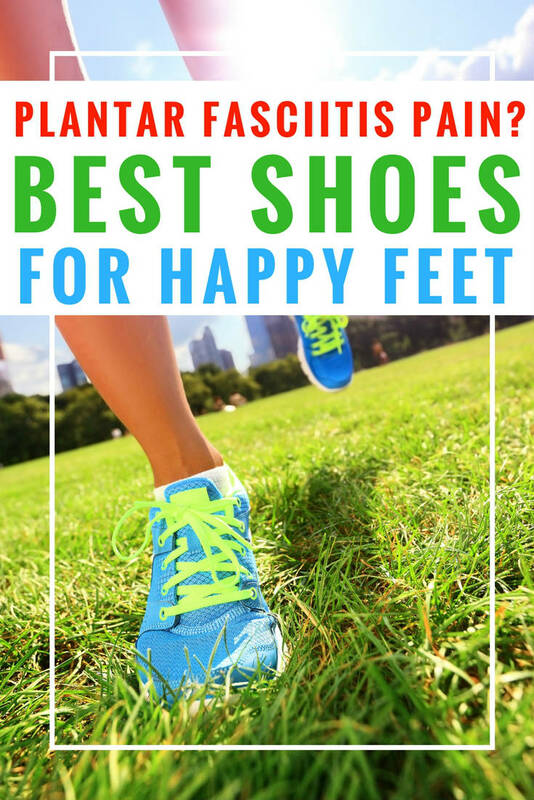 Here we provide some tips and tell you what are the best shoes for plantar fasciitis to help you select the best footwear. Even as you look for other remedies and treatments for plantar fasciitis, it is important to note that you will still need to change your footwear. And so knowing how to pick the best shoes for plantar fasciitis will always be an essential step when dealing with the foot problem. But, to choose the right shoes, you will only need to consider the following important things. The fit is always the first factor to consider when shopping for any pair of shoes, and it is even more critical when trying to get shoes to help you deal with plantar fasciitis. Wearing the wrong shoe sizes can make the problem worse for you and so you need to make sure that whatever pair you pick regardless of the type and style is just the right size for you. Tip! Trying out the shoe before buying and shopping in the afternoon when your feet have expanded to their peak size is the best way to make sure that you get something with the right fit. Any shoe for plantar fasciitis that you buy should provide sufficient arch support. The design should allow the footwear to provide adequate support for the arches when standing, walking, running and even when squatting. Arch support helps to prevent further injuries on the plantar fascia ligament and also prevent the development of flat feet. Also, wearing footwear with sufficient arch support will lessen the pain that comes with plantar fasciitis to ensure that the foot problem does not prevent you from doing your regular activities. The heel tends to be the most painful part of the foot when dealing with plantar fasciitis and so you should always make sure that the shoe you pick has sufficient cushioning around this area. Heel cushioning will increases the padding that your feet will get and also and also reduce the pressure and shock that will come from walking or even standing. You will need to stretch your toes and the bottom part of your feet a lot when dealing with plantar fasciitis. And so it is essential to make sure that the shoe that you pick has enough space on the toe box to make this possible. Also, you will not want to wear footwear that causes your toes to cramp up and so it is necessary to pick a pair with a toe box that is wide enough. One way to make sure that the toe box size is sufficient is to try to wiggle your toes when wearing the footwear, and if they move freely, the pair is okay. When it comes to the soles, you will need to consider both the insoles and the outsole on the shoe. For the insoles, the most important thing is to make sure that they have enough padding to cushion your feet against the shock that come from stepping on hard surfaces. Also, the insoles should be removable in case you want to replace them with orthotics. When it comes to the outsole choose something stiff that will provide enough shock absorption and for this rubber is always the best option. The best shoes for plantar fasciitis take into consideration all of the above: the soles, toe box, heel cushioning, arch support and fit. 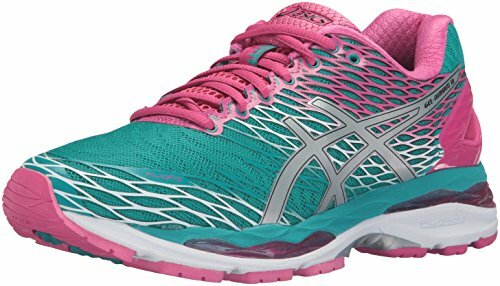 ASICS Gel Nimbus 18 is another comfortable plantar fasciitis shoe that is available for both men and women. It is also a relatively affordable pair if you compare it to others. And it features a sturdy and breathable synthetic/fabric upper section and a shock absorbing rubber outsole. 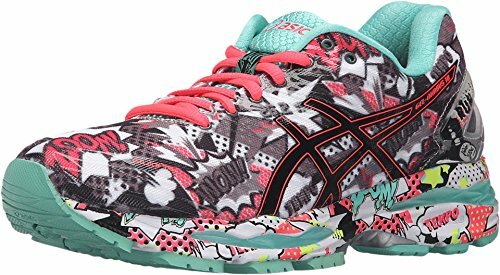 It has a unique FluidRide Midsole that will provide ultimate cushioning and bounce back while also reducing the overall weight of the shoe. There is also a rear and forefoot gel cushioning system, heel clutching system for extra support and seamless construction to minimize the potential for friction and irritation. And you can get the shoe in close to a dozen stylish colors. Click here to see colors, prices and more. 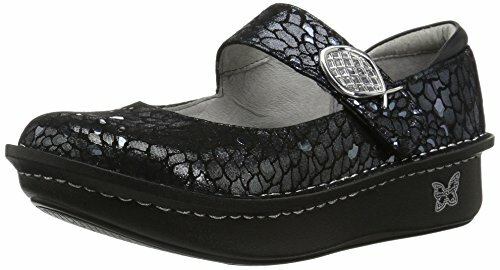 If you are a woman struggling with plantar fasciitis and want a comfortable and supportive shoe that also looks attractive, the Alegria Women’s Paloma flat is an excellent pair for you. It is a genuine leather flat sole shoe that is quite affordable, and so you will get value for your cash. The platform is about an inch high, and it is about 1.3-inch high at the heel. 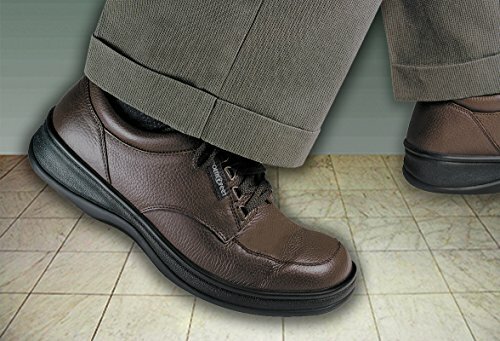 Also, it has a cushioned platform sole to protect your aching feet from standing and walking shocks. You also get to choose from plenty of color options that range from black and taupe all the way to some vibrant, gorgeous patterns and colors. Click now to see prices, colors and more details. The Vionic Women’s Walker Classic shoe is a simple pair that still provides all the support and cushioning that women with plantar fasciitis need. It features a full grain leather/mesh upper section construction for extended durability. 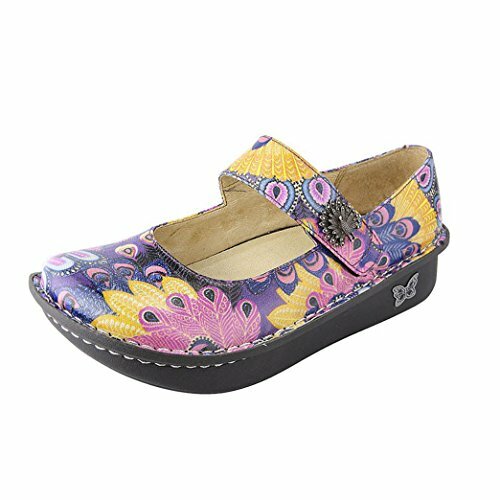 And this pair uses a synthetic sole that is flexible enough and also handy for shock absorption when walking or standing. Other things that make this an outstanding shoe for plantar fasciitis include the shock-absorbing EVA midsole, a polyester upper lining, and a sock liner. Click here to see prices and more details. This leather shoe by Orthofeet is not only for offering relief for men with plantar fasciitis but is also stylish footwear that any man would want to wear. The Orthofeet Avery Island comes in an oxford shoe design, and it will be ideal for men with various foot problems including arthritis. These plantar fasciitis shoes will have a lightweight sole that will help to soften each step that you make. And it provides adequate orthotic support thanks to the contoured orthotic insole, gel-padded heel-seat, and anatomical arch support. The non-binding upper section and extra deep design and spacious toe box enhance the comfort while the soft and seam-free lining with foam padding eliminates the pressure points. See prices, availability and more details now. You can always trust New Balance to have a pair of shoes to help you with your plantar fasciitis problem. 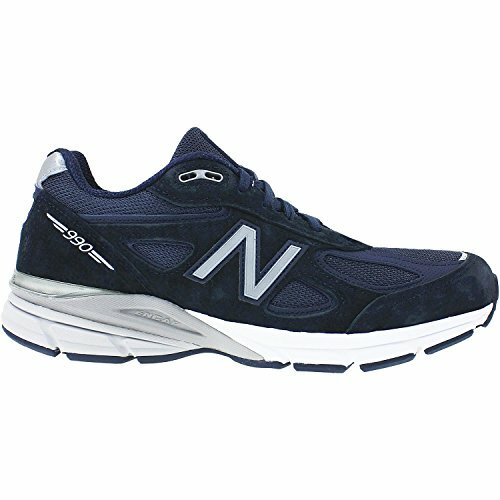 The men’s New Balance 990V4 are a comfortable pair that you can get in more than a dozen different colors. The shoes feature a durable and breathable pigskin and mesh upper section and a sturdy rubber sole that will be very useful for absorbing shock and pressure. There is also dual density collar foam to add to the comfort and an EVA core heel to provide sufficient cushioning for your heel. Click here to see details, prices and more information. Shoes provide one of the best ways of dealing with plantar fasciitis and they also supplement other treatments. There are many shoes out there that can help to prevent and correct plantar fasciitis but to pick the best pair you will need to consider things like the fit, style, padding and the quality of the soles. With the shopping tips and reviews above to help you out, you should not have any difficulties choosing the best shoes for plantar fasciitis. Great article explaining how to buy shoes to alleviate pain and discomfort caused by plantar fasciitis. Thanks so much! Plantar fasciitis is a life changing pain even though its very common. My friend have this and it change the way she lived every day. Thank you so much for the suggestions. I would love to give a pair or two to her to help her get back up.